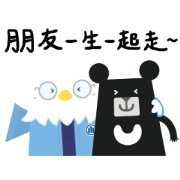 Allianz × Taiwanbar: Happy Together! Allianz Life Insurance and Taiwanbar have teamed up to accompany you around the clock. Download these cute stickers and have fun with them today!